Warning! 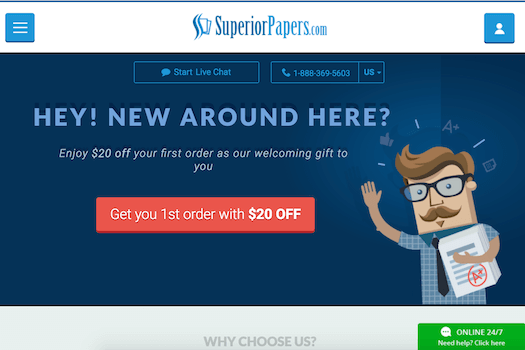 SuperiorPapers.com is a part of Universal Research Inc. essay writing services network, notorious for the breach of contract and selling essays that have already been sold in the past. SuperiorPapers.com is an essay writing service run by Universal Research Inc. This site claims to deliver top quality, meet any deadline, and give great prices. According to SuperiorPapers reviews, students paid a fortune only to get an average written essays. You can read my investigation about BestEssays.com, Universal Research Inc. most popular service, if you want to learn more about this company. They were also caught in papers reselling. Clearly, this is serious, so taking a risk with this company has to be a crazy decision. There are also reviews that praise this service, but one can tell that they mostly come from fake review sites which Universal Research Inc. multiplies like little rabbits.